August 23rd: sunny. We depart from Trinidad, Colorado to hit the Highway of Legends that arcs in the southernmost part of the Rockies. The rhythm of the road changes constantly, and so does the scenery: we roll into a town where houses have stone fences, into 15 mph windings in the woods, then into an opening by a blue-green lake. August 24th: a thunderstorm in the morning, fine later. We leave our stuff at an inn in Arroyo Seco, New Mexico, and ride south to visit Taos Pueblo. Even today there are about 1,500 Taos Indians in their adobe buildings. One of them told us that they're having a festival in a few days, that certain folks have already begun their pilgrimage to a lake in the mountains. August 25th: our first day off in a long time. August 26th: we're on the road again, headed to Colorado's southwestern region. When it starts drizzling in the hills, my motorcycle runs out of gas. I take some from the other, more fuel-efficient bike and ride on, coasting with the engine turned off when a downhill comes. We barely make it to a gas station just as the sky clears again in Chama, New Mexico, and reenter Colorado a while later. August 27th: we ride west in the mountains of southern Colorado. As we pass Durango, we notice there're low clouds ahead that could be a problem. Soon after our helmets catch the first drops, it starts pouring so hard we can't even tell if we're in the right lane. We obviously don't have a chance to look at Mesa Verde N. P. so we just go past it, and check in at a motel as soon as we get to the city of Cortez. August 28th: fair. The desert and rock landscape starts as we enter Utah. The surface of the rocks is loquat-yellow first, brick-red for the next several miles, and then the light-brown Monument Valley comes into view. Another 120 miles across the wilderness, and we reach the Grand Canyon at sunset. August 29th: a day off. A lone American condor wheels above a canyon that tens of thousands of years have carved. We went down into New Mexico from Colorado and took two days' break in Arroyo Seco near Taos. Then we came back into Colorado, and as of tonight we're in a town called Cortez near Mesa Verde National Park. My RZ ran out of gas while riding in the drizzle on the 26th, and we got caught by a pouring rain on the 27th: Thus we haven't traveled much distance. The picture here was taken in front of a post office in Pagosa Springs, a hot spring town we stayed in last night. There we shipped some items we wouldn't need anymore to Japan. After that we got really soaked in a heavy rain, and didn't get to see anything scenic at all. We left Cortez, entered Utah, rode through the Monument Valley and came straight into Arizona and then to the Grand Canyon. 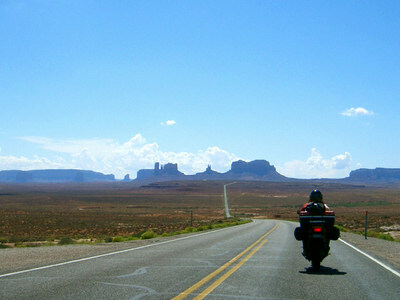 The picture was taken when we stopped in the Monument Valley to feed 2-stroke oil to my RZ. There was a rescue crew for a car that seemed to have got stuck in a roadside ditch while the driver was paying too much attention to the landscape.